If you're like many people, you have a box of family photos and papers in your attic or basement, just waiting to be organized someday. Proper storage of your family archives is essential if you want to protect them from the ravages of time and pass them on to future generations. Fortunately, it only takes a bit of time and a few helpful products to safeguard your family history for years to come. There's more to creating archives than just ensuring the proper storage of your documents; you'll also need to organize these items for easy access in the future. It helps to have a process that minimizes the number of times you need to touch each item since handling can degrade the quality of delicate paper. Before you open that cardboard box of family history items, take some time to get everything set up. Ideally, it's a good plan to dedicate a desk or card table to this process so you can do a few items each evening or whenever you have time. Choose a location that is out of direct sunlight and away from the hustle and bustle of regular life in your house. Many families have seemingly endless piles of photographs, so tackling these first can make a major dent in your workload. Decide how you'd like to organize the photos, and label the envelopes or dividers accordingly. Many people choose to sort by decade. Create computer files that correspond to your hard copy filing system. Identify - Examine the photo carefully. Can you determine its age? What about the names of the people in it or anything about the location? Write down any information you have on the back of the photo. According to Family History Magazine, you should use a pencil on old photos and a photo-safe pen on newer photos. Scan - Scan the front of the photo, carefully naming the file with all relevant information. It helps to include names of people and dates in the file name. Also scan the back of any photo with writing on it. Save the file in the appropriate folder. File - File the photo in the archival storage box using the organization system you set up. Many documents, such as birth certificates, newspaper obituaries, and marriage certificates, contain information about the important life events of your ancestors. Other paper items, like letters, can add a further dimension to the names and dates in your family tree. Record notes - Many documents are fairly self-explanatory; however, it can help you organize if you also jot down as much information as you can about the person or people they reference. Write your notes on a separate sheet of acid-free paper using acid-free pen or pencil. Do not use sticky notes on your documents as the Smithsonian Institution reports that they can be terribly damaging to your papers. Scan - Gently scan each page of every document, front and back. Name the file with all relevant information. Set up a folder on your computer for each decade and save the file in the appropriate folder. File - Carefully place the document and your sheet of notes in a file folder. Label the folder with the name and date of the document. Place the file in the archival storage box. Family Bibles, journals, old scrapbooks, and other important books also require special care. Preserving these is important although the process differs from the one you use to preserve photos and documents. Examine - Wearing your cotton gloves, carefully examine the book for information. You may find notes made by an ancestor, recorded births and death records, and other valuable facts about the individuals in your family tree. Scan - If you do find anything of special value, carefully scan these pages. Create a computer file for the book and save each scanned page to that file. Preserve - Place the book in an adjustable archival box and follow the product instructions for making sure it is safe. Record the title of the book and any other information on the exterior of the archival box. Once you've preserved and scanned everything in your collection, it's time to choose a place to store your family history archives. According to the Jewish Women's Archive, you should never store these precious items in your basement or attic. Instead, you should select a location that has a relatively constant temperature and humidity level. Ideally, look for a place that's about 68 degrees Fahrenheit and 40% relative humidity. The place you choose should be dark to avoid fading and damage from light. Consider storing your family documents and photos in an appropriately-sized fireproof safe. Select a safe that is also waterproof in case of flooding. If you don't choose to use a safe, try placing all your archival storage boxes into a single larger box. That way, if there is time to do so safely, you can easily grab this box during an evacuation. Upload your photos and documents, as well as your family tree, to an online genealogy site like Ancestry.com. That way, your work is available to others, and your archives are safe. Use a cloud back up service like Google Drive to preserve an electronic copy of your scanned photos and documents. If something happens to your computer, you will still have all your files. 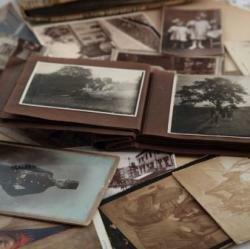 Consult your family tree to find other family members who may have original documents and photographs. Often, people see this responsibility as a burden and are more than happy to pass the originals on to you in exchange for easy-to-store scanned copies and access to your other research. Search eBay for photographs, maps, journals, and local history books. You'd be surprised what can turn up for auction, often at affordable prices. Simply search for your family's name and location. Don't forget to include oral histories in your archives. You can use a digital recorder or help relatives fill out oral history forms. Either way, you'll be preserving the early memories of elderly family members. Creating your family archives is a big job, but breaking it down into a basic process can help you get the task accomplished. You are providing a service for future generations by making sure your family's treasured photographs and documents are safely preserved for years to come.